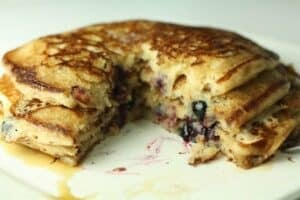 Sourdough pancakes with fresh blueberries. 1) The night before serving pancakes, combine barm, flour, and water in a large container. Make sure it’s at least twice as large as your starter because it will grow. Stir everything together. 2) The morning of pancakes, add final batter ingredients to a bowl and whisk them all together! 3) Add the really runny mixture to your pancake starter from the night before. Fold it together until you have a batter. 4) Get out your favorite griddle and melt some butter on it. 5) When butter is melted and griddle is very hot, add 1/2 Cup of batter. That makes a pretty big pancake. Feel free to go for 1/3 of a cup for smaller or 2/3 of a cup if you like the pancake to hang off the plate. 6) As soon as the batter is poured on the griddle pup 10 -15 blueberries down on the pancake. 7) Assuming the griddle is hot, you should be able to flip the pancake after about 3-4 minutes. When you see lots of large bubbles popping up and the edges are starting to turn up, that’s when you know it is time. 8) Move the pancakes straight to a plate and add some butter if you want. A good drizzle of maple syrup is essential! Serve immediately. Adapted from the Joy the Baker recipe. This delicious recipe was brought to you by Macheesmo. Read the full post at https://wp.me/pkSYO-24m.